This photo was taken in September of 2005. 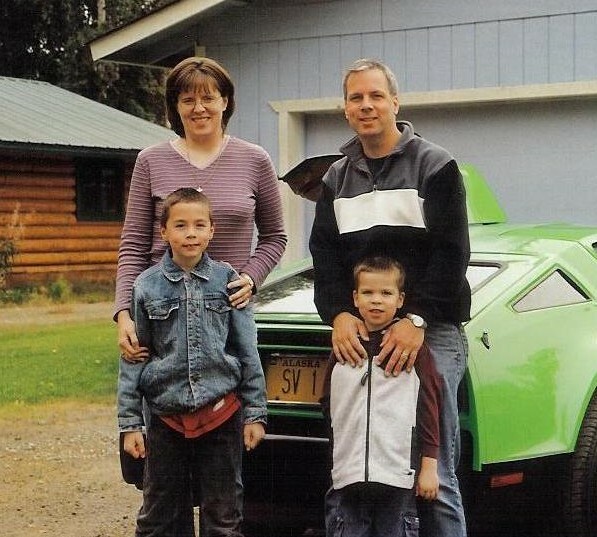 Zach was born on February 7, 1997, Noah on January 12, 2001, my Bricklin was born on June 6, 1975. We're just 100 miles south of the Arctic Circle. Fairbanks is a metropolitan area of nearly 100,000 - within Alaska, only Anchorage is larger. It's very remote. Hundreds of miles in any direction to get to another sizeable city. Drive south on the Parks Highway and it's 357 miles to Anchorage (pop. 275,000). Drive south on the Richardson Highway and it's 368 miles to Valdez (pop. 5,000). Valdez is the terminus for the trans-Alaska pipeline - and is famous for the ship that Captain Hazelwood parked on top of Bligh Reef! Drive east and it's 600 miles to Whitehorse (pop. 25,000). Driving to our capital of Juneau (pop. 30,000) requires 660 miles on the road, plus a day on the ferry down the Inside Passage. Drive north and it's over 500 miles to Prudhoe Bay (on the Arctic Ocean) which is inhabited by a few thousand oil workers who leave whenever they get time off! An aerial view of downtown Fairbanks. The river running through town is the Chena. It twists and winds for about eight miles before emptying into the Tanana River. The Tanana drains into the Yukon river - the nation's third largest after the Mississippi and the Missouri. 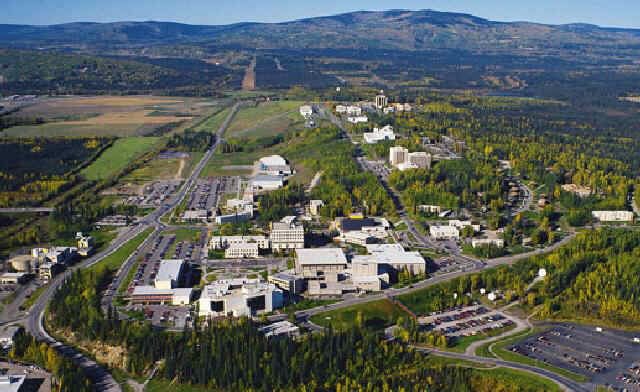 Fairbanks is the statewide home to the University of Alaska system. The campus is about 5 miles west of downtown, and only a few short blocks from my house. In the winter time when the Bricklin is parked, we enjoy attending college hockey games. UAF has a division one hockey team that is a member of the WCHA. UAF is also home to the Nanook Rifle team, which has built a dynasty as a Division One national champ, winning the title ten times. Only West Virginia has won the title more often. Our UAF Nanooks have supplied many members to the USA Oympic team! I bought it back in 1984 in Minneapolis when I was still living there. I drove it up the Alaska highway in January of 1990. 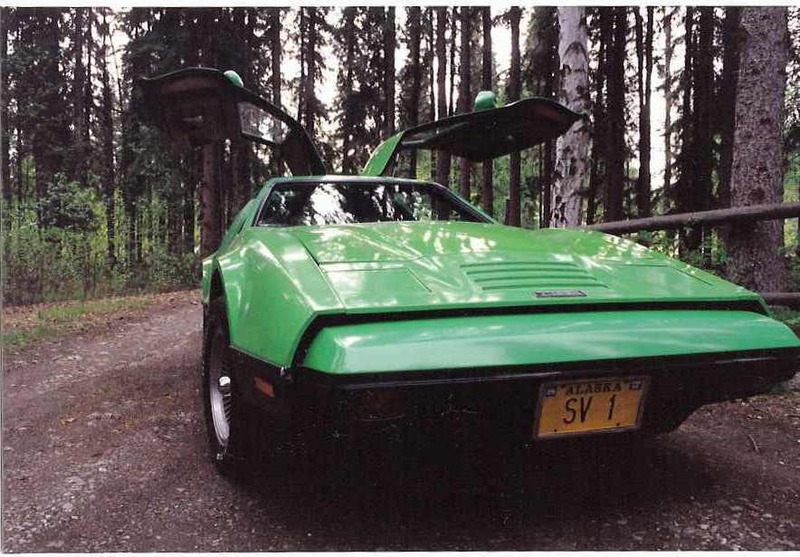 Probably the only Bricklin that ever drove right through the middle of a herd of caribou! So close I almost could've rolled down the window and petted 'em!